After three days, the Israelites set out from Shittim, following the ark of the covenant as it leads the way to the Promised Land, careful to leave space behind the Ark. The priests went ahead of the people with the Ark of the Covenant. On God’s orders, the priests stood in the waters of the Jordan, damming up the water and allowing the people to cross the Jordan River. This was God’s way of showing the people He is with Joshua. God told Joshua to have 12 men, one from each Israelite tribe, pick up a stone from the Jordan River and carry it over to their encampment for the night. The stones are to serve as a remembrance for the Lord cutting off the flow of the River Jordan before the Ark of the Covenant. The priests stayed in the River until all the Israelites, including the men of Reuben, Gad, and the half-tribe of Manasseh had crossed. 40,000 fighting men in all. Afterwards, the priests were commanded to leave the River Jordan and as soon as they did, the waters returned to flood stage. The people camped at Gilgal on the eastern border of Jericho. Joshua took the stones with him so that all the peoples of the earth might know that the Lord is powerful and that the Israelites might always fear the Lord. 9a) The people had to wait three days on the banks of the Jordan River. The priests are to go first into the Promised Land, carrying the Ark of the Covenant. The people need to stay at least 1000 yards behind the Ark. The people were told to consecrate themselves before entering the Promised Land. 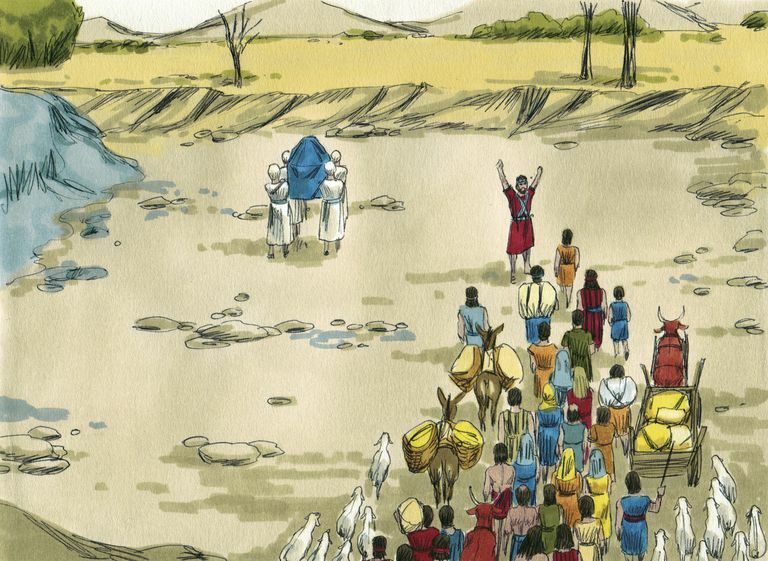 The priests stopped the Jordan River, so the people could cross. b) Joshua told the people that the Ark of the Covenant would go ahead of them into the Promised Land carried by the Levites, or the priests. The priests were represented by 12 men, one from each tribe. As soon as the priests’ feet touch the Jordan River, its water will stop flowing downstream and stand up in a heap. This is indeed what happened. 10) The Ark of the Covenant is, also known as the Ark of the Testimony, is a gold-covered wooden chest with lid cover described in Exodus 25:10-22 as containing the two stone Ten Commandment tablets given to Moses by God. Hebrews 9:4 tells us it contains “the gold jar of manna, Aaron’s staff that had budded, and the stone tablets of the covenant.” Later, when Solomon would build the temple (which we get to read about as well! ), the Ark will be housed behind the second curtain in the Most Holy Place where God dwelled. The Ark of the Covenant is symbolically where God dwelled. Hence, it symbolizes God going before the people and leading them into the Promised Land. Love all of the allusions and throwbacks to Egypt! God goes before the people with the Ark (like He did in the cloud). God stops the Jordan River (like He did the Red Sea). God is omnipotent. God does things for our benefit. Watch VIDEO of the Book of Joshua if you haven’t had a chance yet. In 1927, and earthquake caused the 40-foot clay banks of the Jordan River to collapse, totally damming the Jordan for 21 hours. Sitting by the swollen Jordan River for three days must have produced anxiety and doubt in the Israelites’ minds: how would they cross? Theme of Joshua 3: God’s people are utterly helpless without Him. Everything God does is deliberate. Having the people wait three days would build their faith as they no doubt were growing restless and agitated. Why stay 1000 yards behind the Ark of the Covenant? So all could see. After all, the Ark of the Covenant was leading the way to a land none of them have been to before. It was important to not get lost and to maintain order with millions of people. Sanctifying themselves helped them keep a clear focus on God. In faith, Joshua followed God’s commands. God in turn encourages Joshua. Faith leads us into greater victories than law ever could. The step of faith of the priests in the water happens to us all every day, every moment of our lives. The moment can be short or long. Regardless, take that first step! Note: God begins the journey into the Promised Land with a supernatural miracle: the stopping of the Jordan. Out of Egypt (old life) with a miracle and into a new life with a miracle. God leaves no room for doubt. Fun Biblical Fact: The ark is referred to 14 times in these 17 verses. To face the impossible in our lives, look to Jesus, our Joshua. He is the fulfillment of the Ark. Theme of Joshua 4: Trust – The Israelites knew they had to trust God with everything they had, because the challenges only got bigger in the Promised Land – but so did the blessings. Remembering what God has done for you is huge. Most of us forget very easily God’s faithfulness in our lives when something bad happens. Using something concrete (here in Joshua 4 stones) as a visual reminder of God’s faithfulness in your life is one of the best things you can do. It not only reminds you, but it also serves as a reminder to your children about God’s greatness. The priests stood in the Jordan River throughout the entire crossing, representing God’s presence and strength. Gilgal will become the Israelites base of operations for the conquest of the entire Promised Land. Therefore, the first step is to set up a memorial to God’s great works. 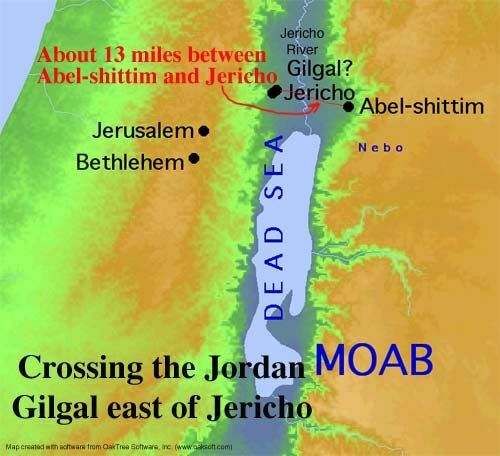 Fun Biblical Fact: Gilgal is mentioned 39 times in the Bible, primarily here, in the book of Joshua.